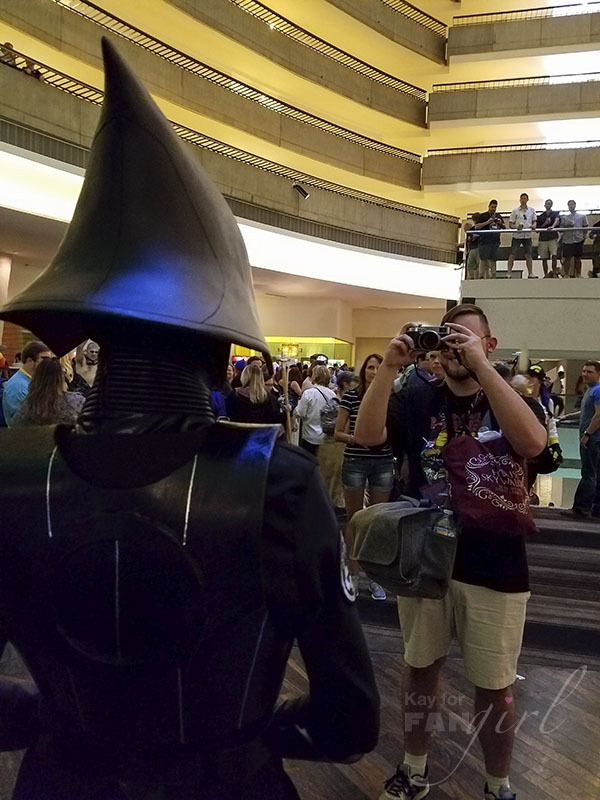 I heard several people wonder out loud which there would be more of wandering throughout the five hotels, part of a convention center, and sidewalks that make up Dragon Con. 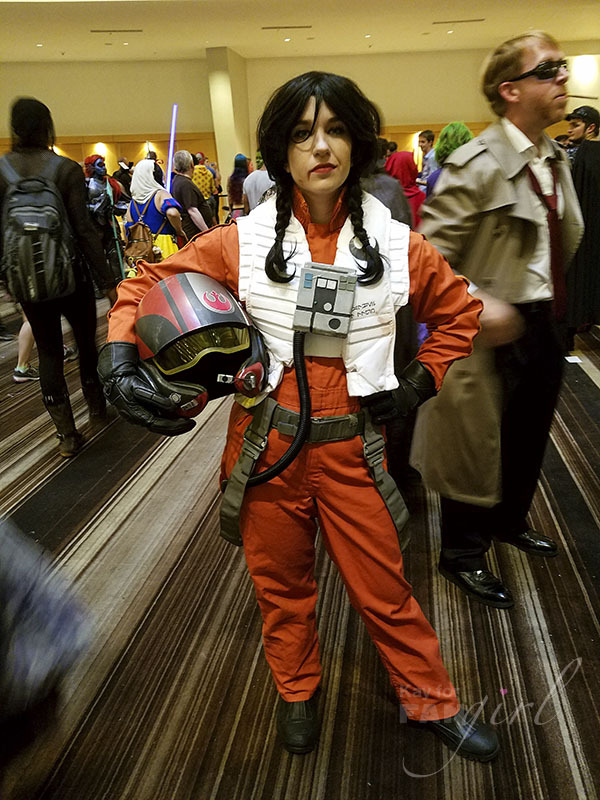 It looked like Rey pulled ahead early, but by the second day Harley Quinn was back to giving the heroine of The Force Awakens a run for her credits. 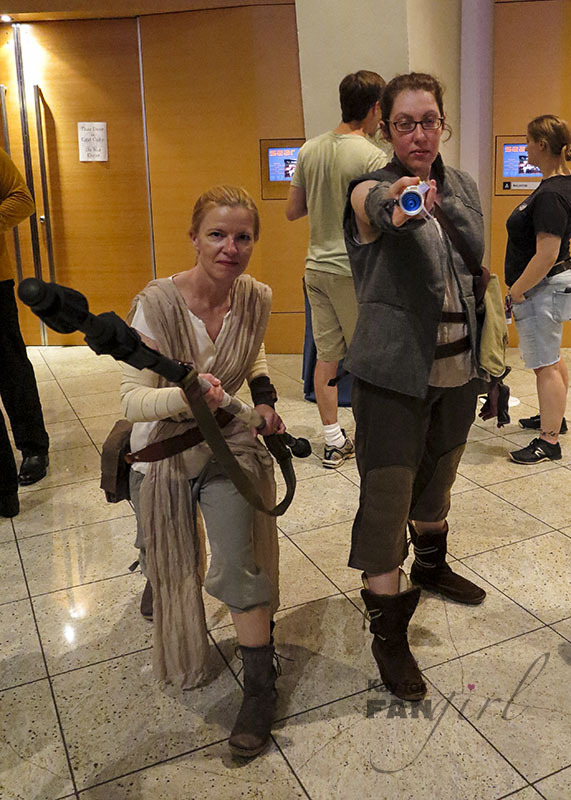 While I have no idea which character actually reigned supreme during the 4-day convention, I did count 43 different people wearing Rey costumes over one 10-hour period (children, women, and men included). 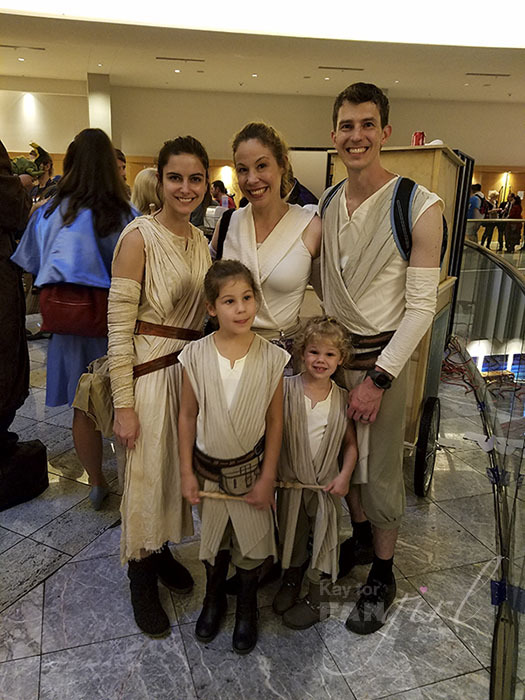 We’ve come a long way from last year when I wore a Rey costume and more than one person asked me if I was “one of those Mad Max wives”. 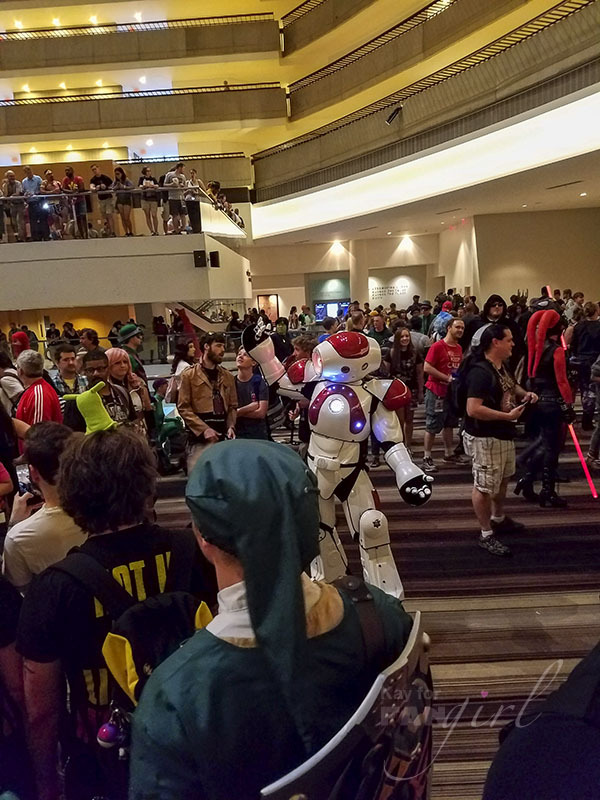 If you’re unfamiliar with Dragon Con, it’s a pop culture event that runs just about 24 hours a day. 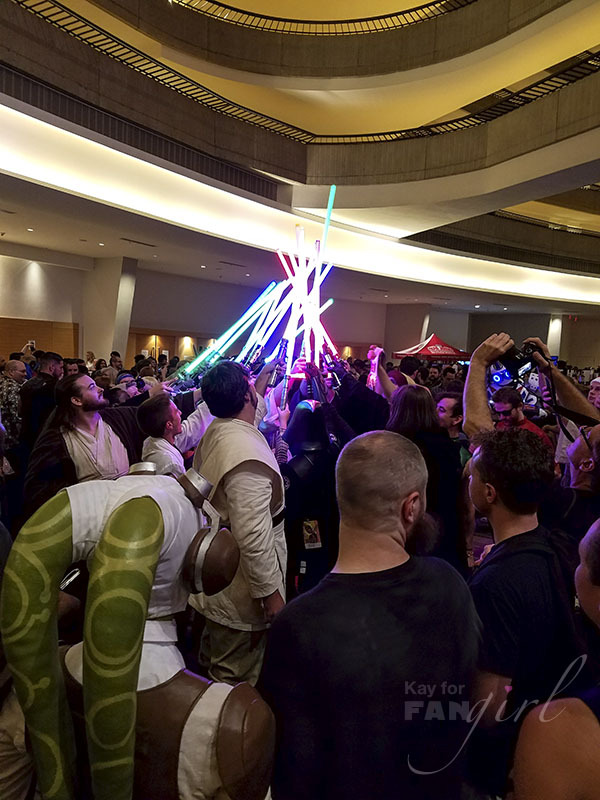 This year, for its 30th anniversary, over 77,000 people showed up to the party. 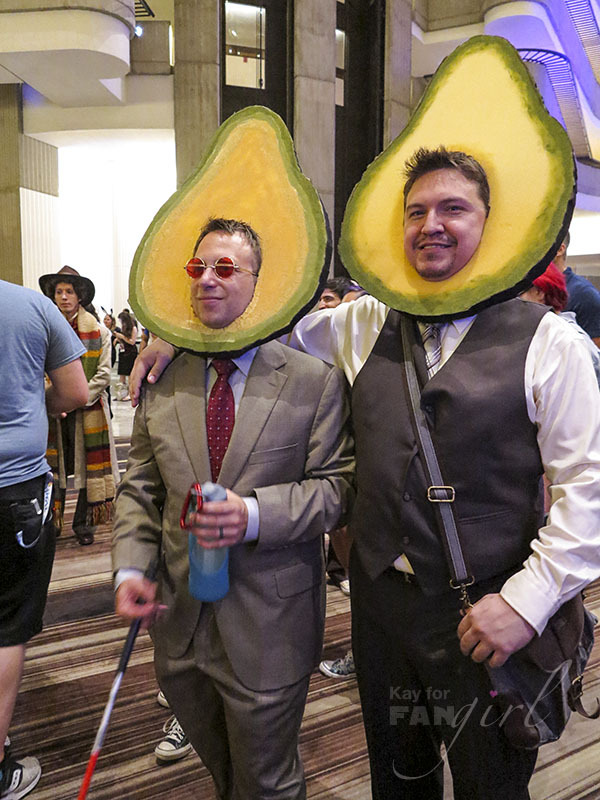 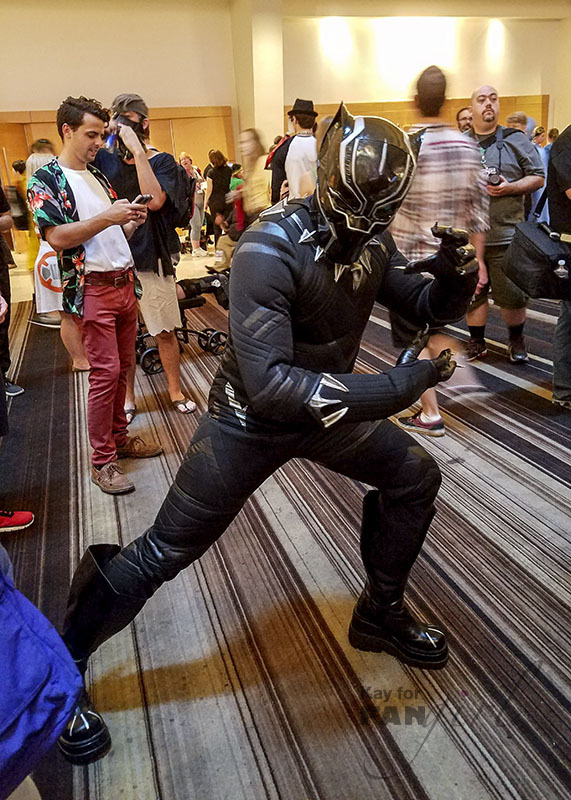 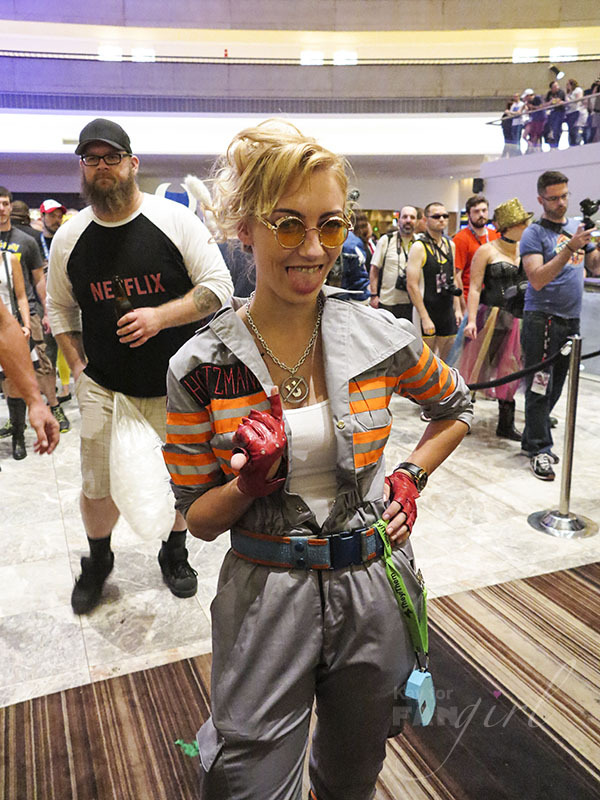 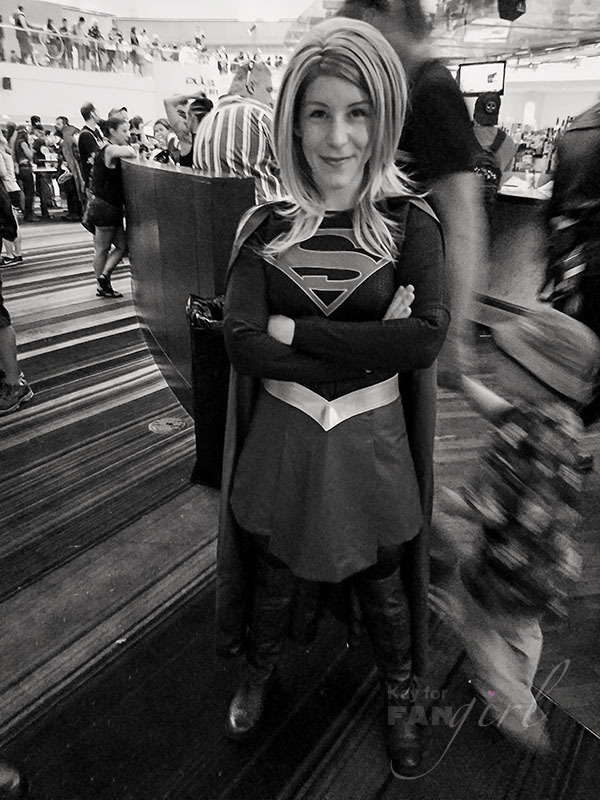 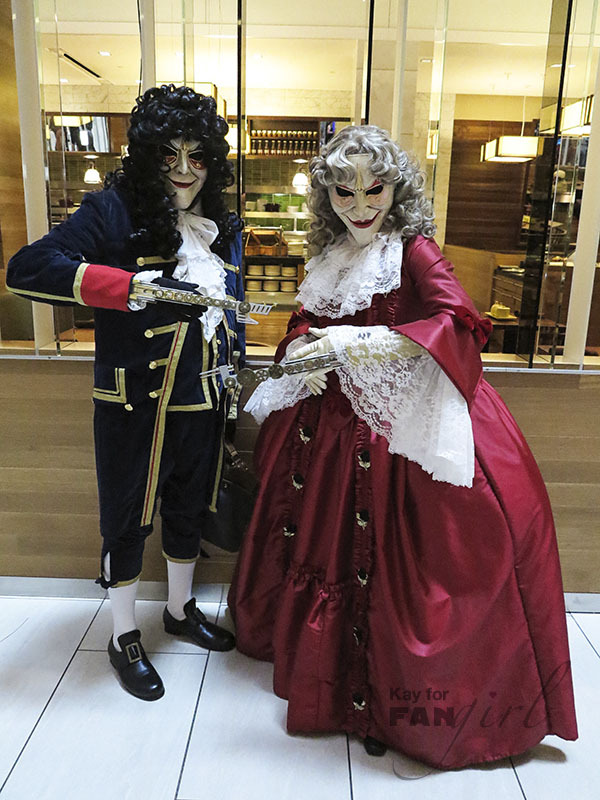 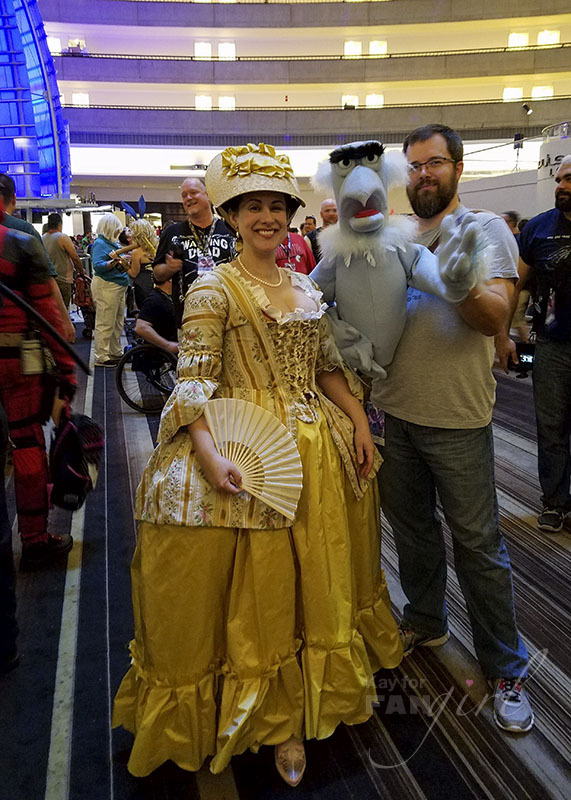 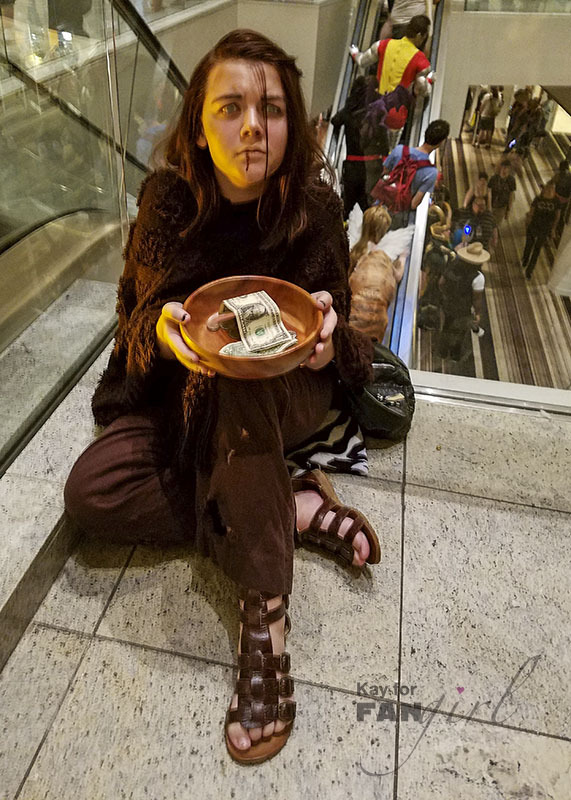 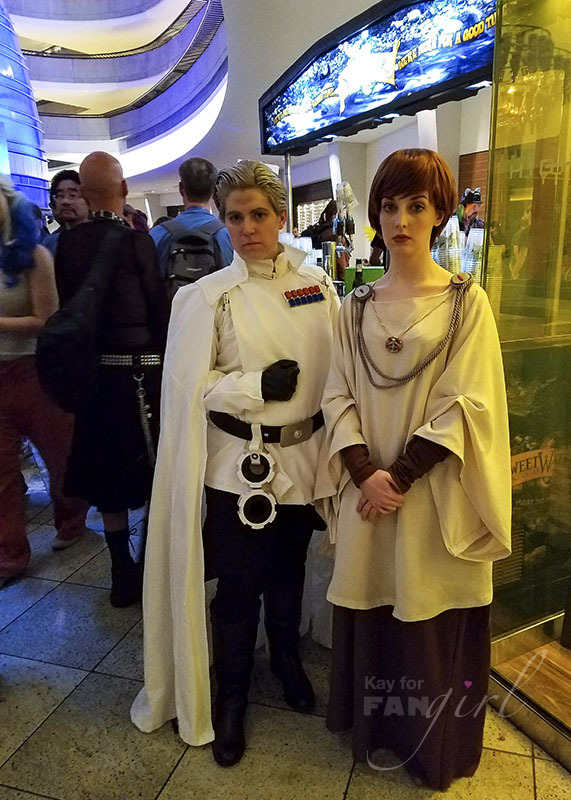 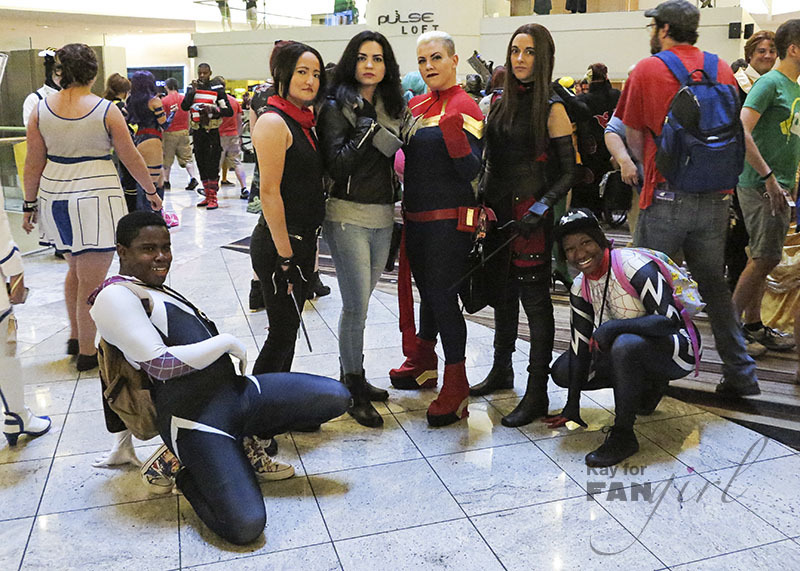 And a very large percentage of them wear costumes or cosplay – from the casual attire to the year-in-the-making ensembles, Dragon Con has a little bit of everything you can think of… and then some things you hadn’t. 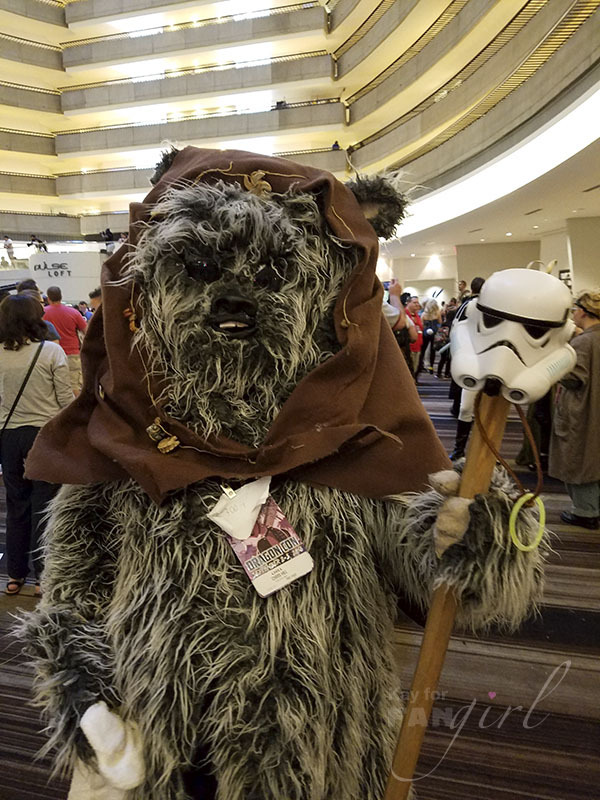 In my costume and cosplay highlights gallery you’ll find robots, mash-ups, superheroes, villains, a bit of geek fashion, Doctor Who, Marvel, DC, and, of course, my speciality – Star Wars. 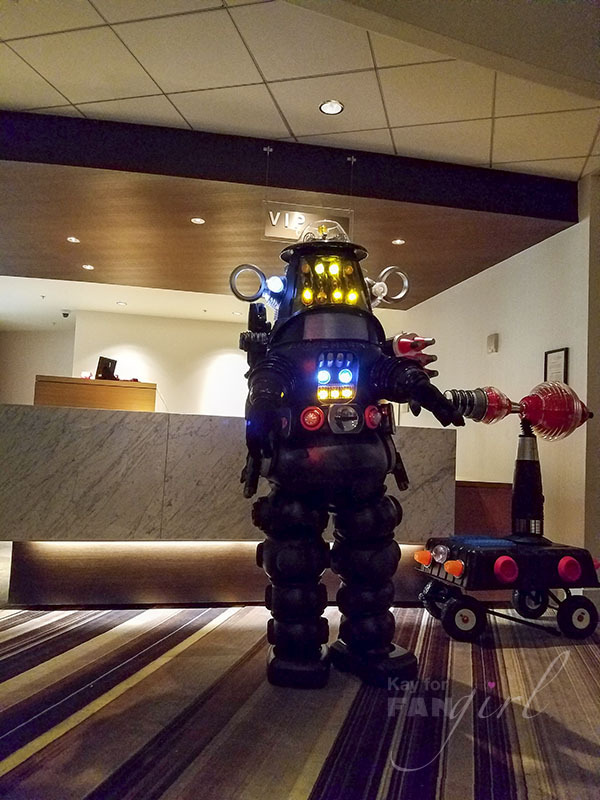 It's a life-size Nao robot! 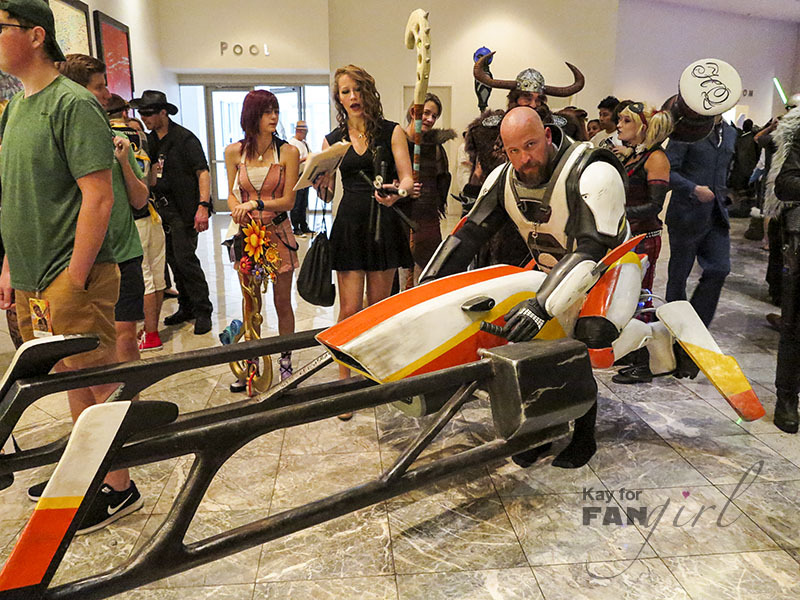 Star Wars speeder bike, coming through! 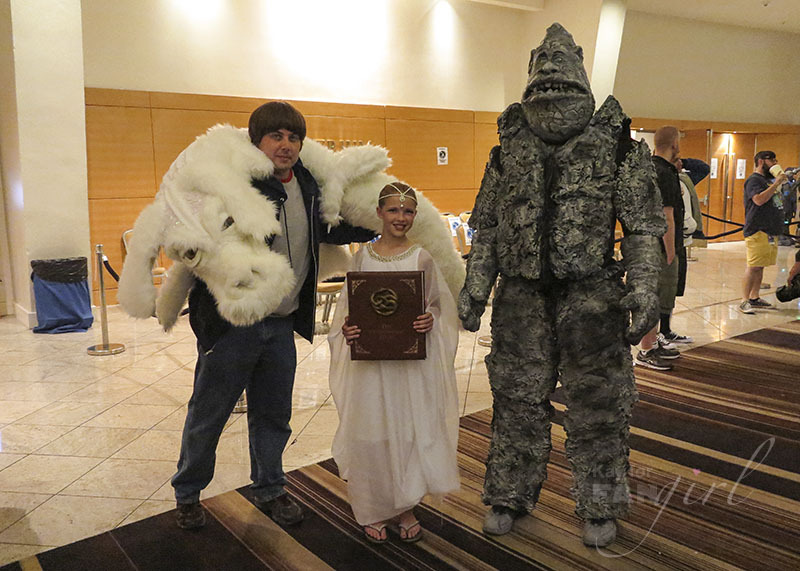 A taun-taun with Luke Skywalker rider AND Captain America! 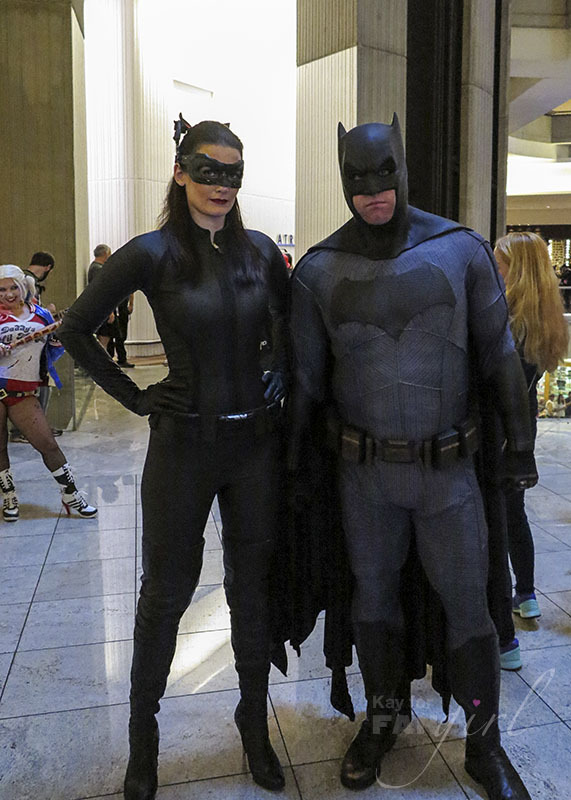 Catwoman and Batman are hanging out these days. 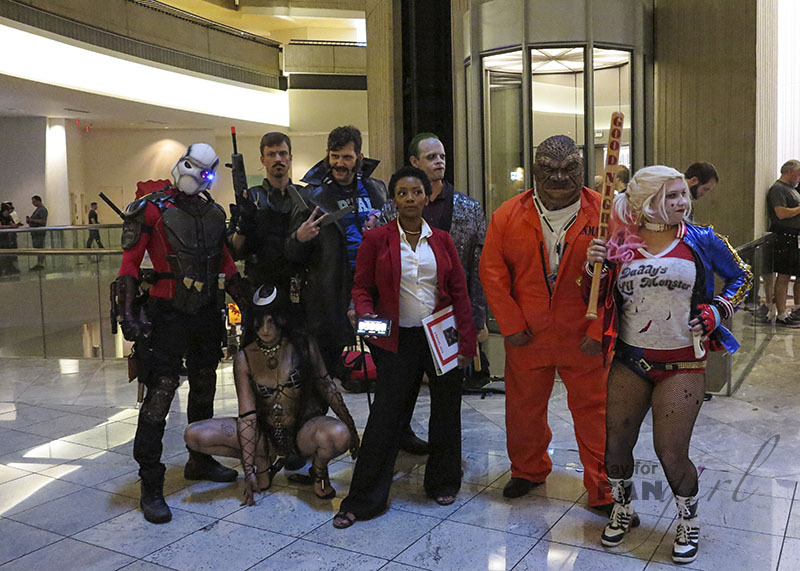 It's the whole Suicide Squad (from the movie). 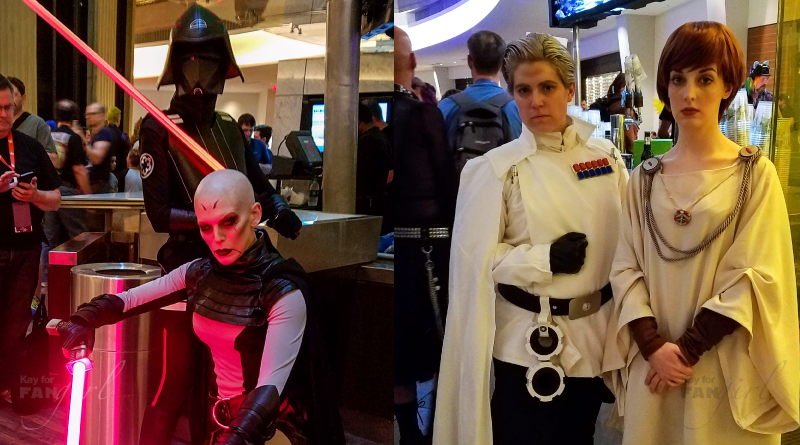 Classy generations of Star Wars bad guys. 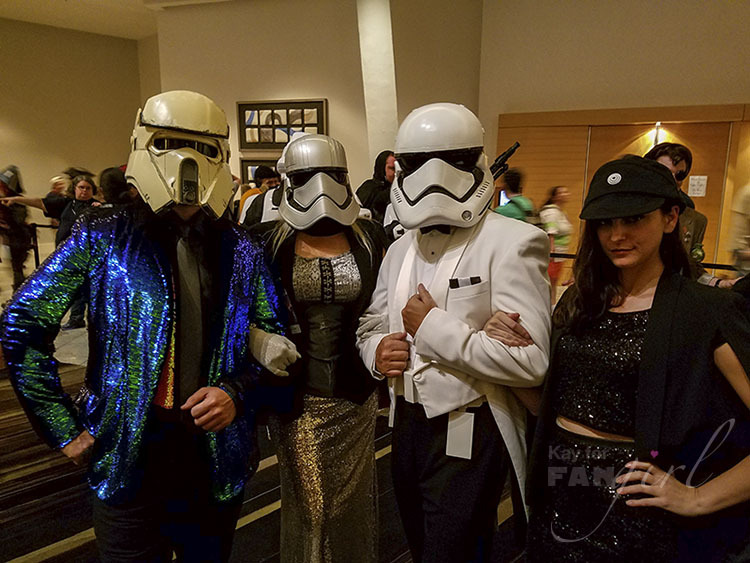 Shoretrooper, Captain Phasma, First Order Stormtrooper, Imperial Officer. 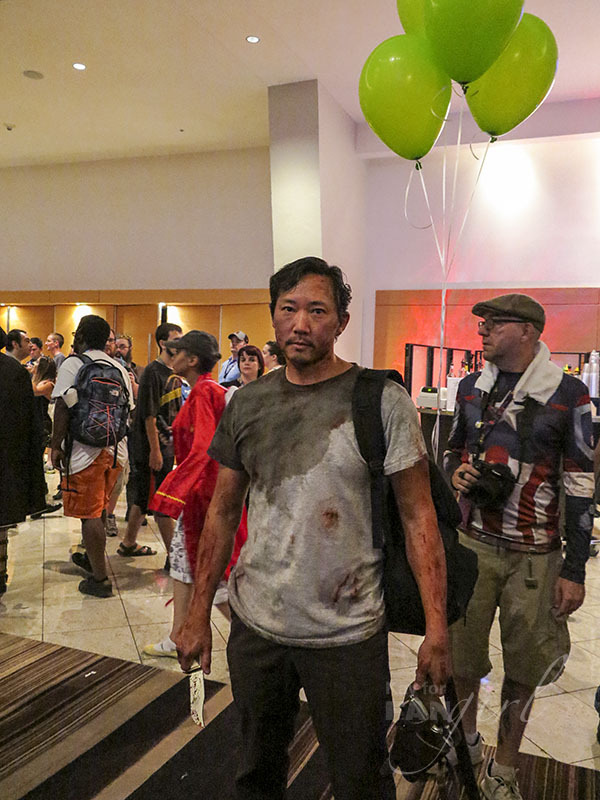 This Glenn from The Walking Dead was pretty easy to find. 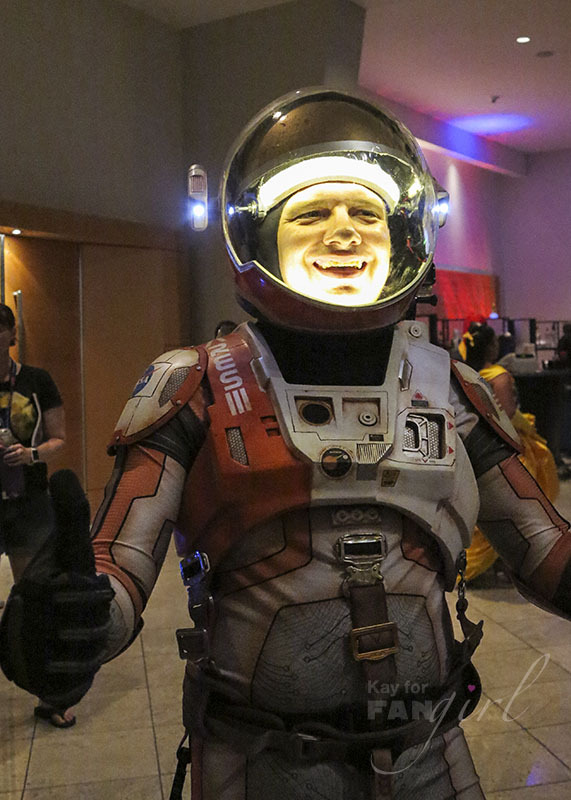 The best part is everyone kept calling him Matt Damon from The Martian instead of his character name. 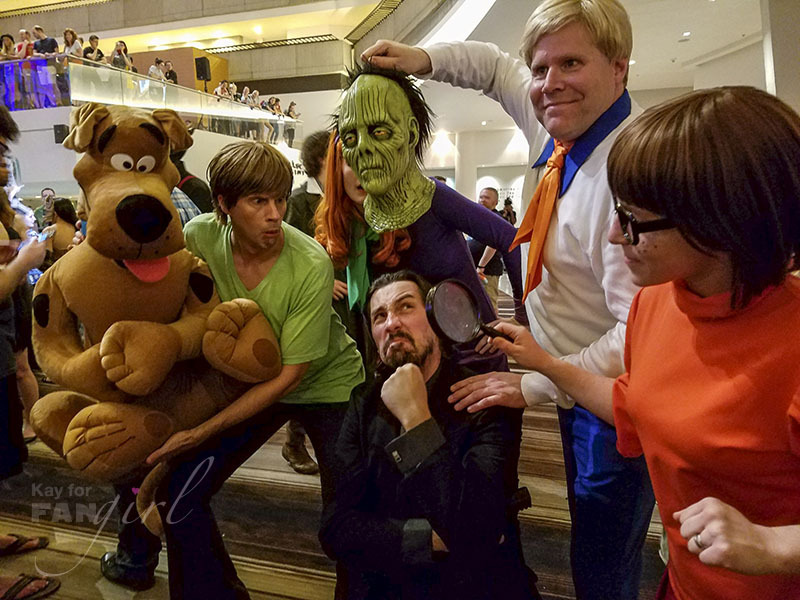 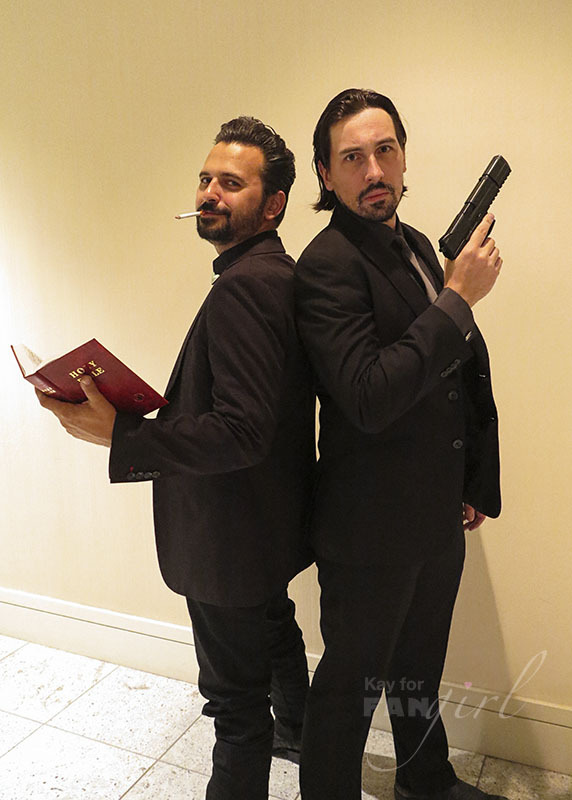 The Scooby Gang caught John Wick! 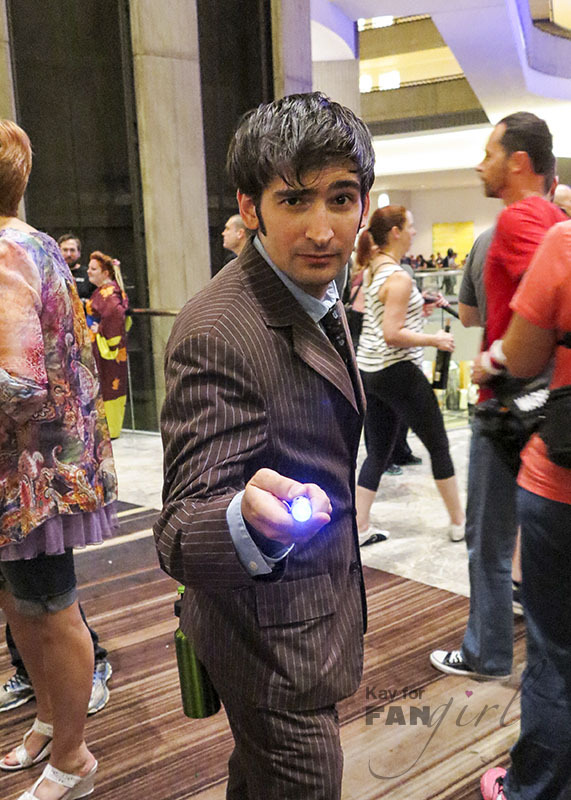 One of the many many Holtzmanns. 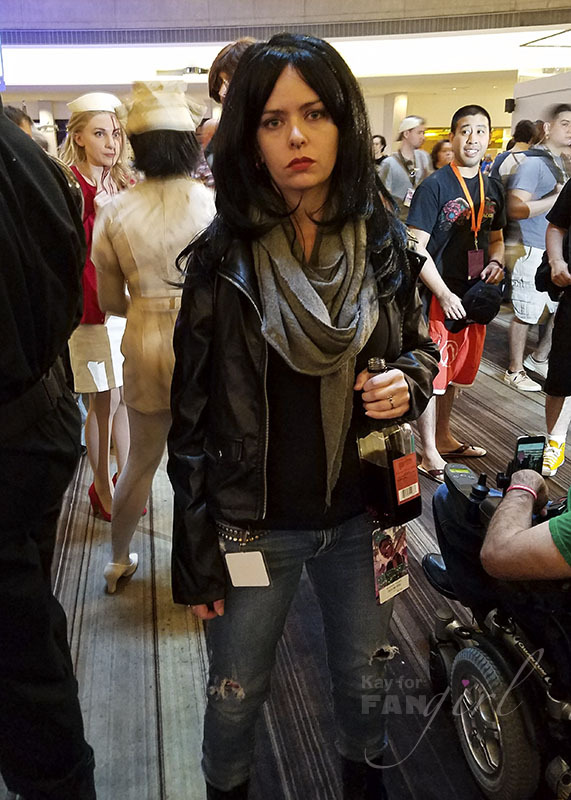 Jessica Jones is so happy to be at Dragon Con. 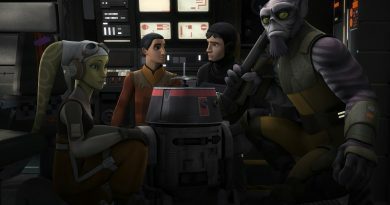 Stand back, the Seventh Sister from Star Wars Rebels has her helicopter lightsaber. 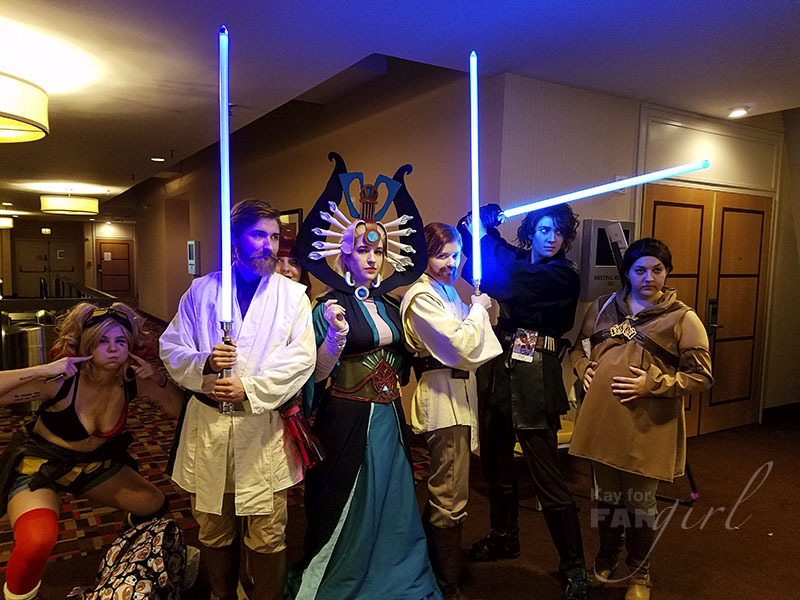 It's a whole The Clone Wars group with (unsurprisingly) a Harley Quinn photobomber. 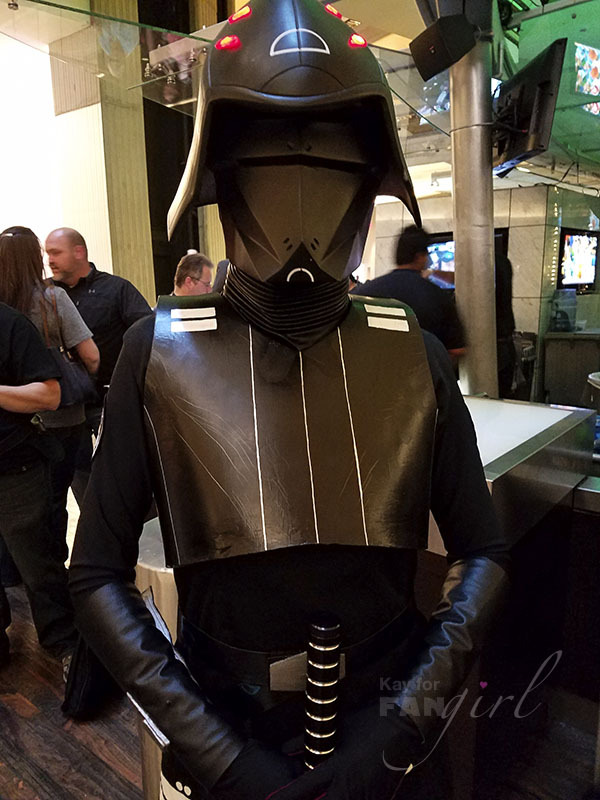 The coolest Darth Vader at Dragon Con – from the end of Return of the Jedi. 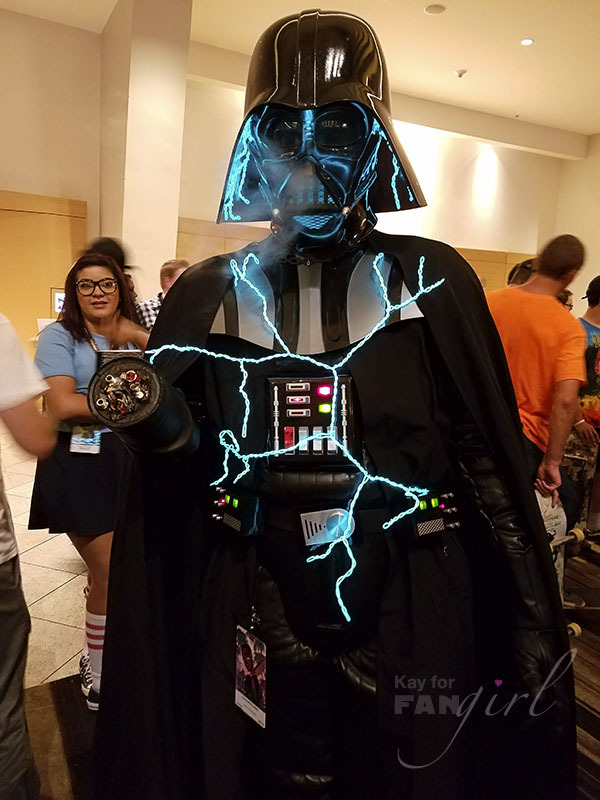 The Force lightning flashed and smoke came out of his helmet. 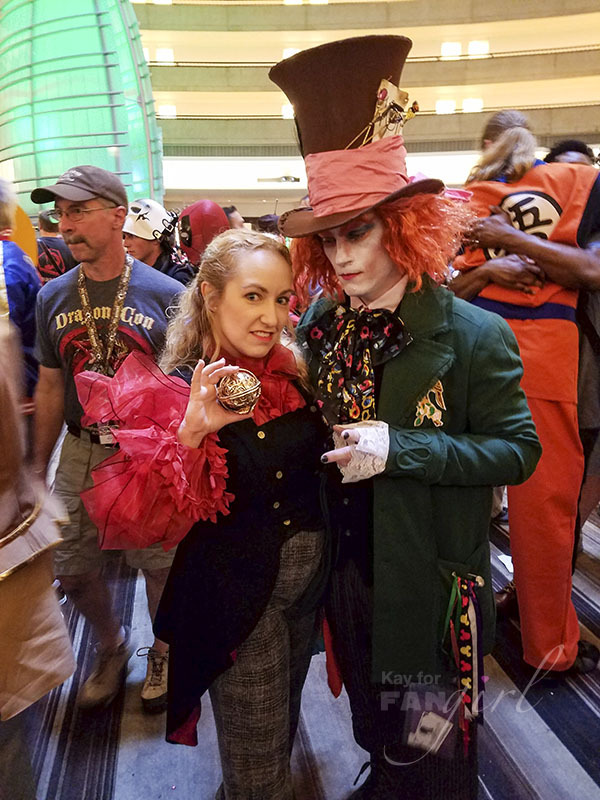 One of the many Suicide Squad Harley Quinns conquering those heels. 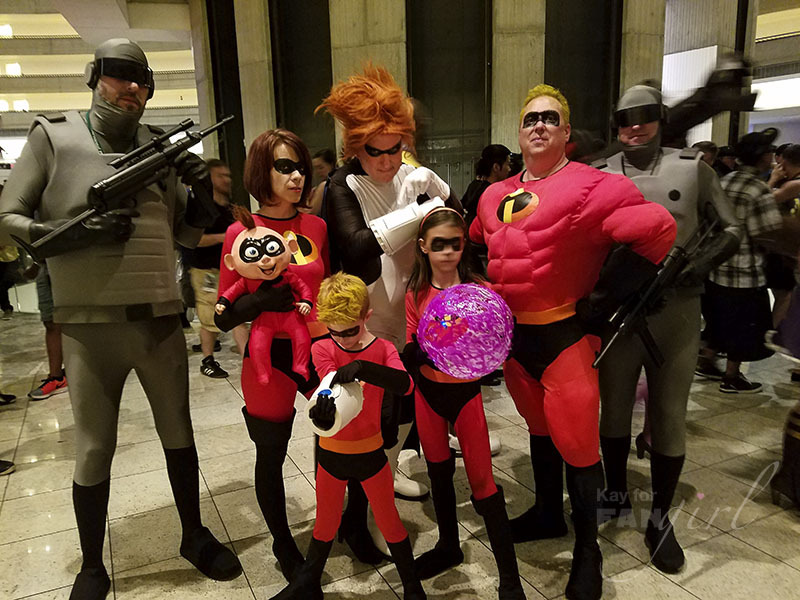 The Incredibles were spot-on. 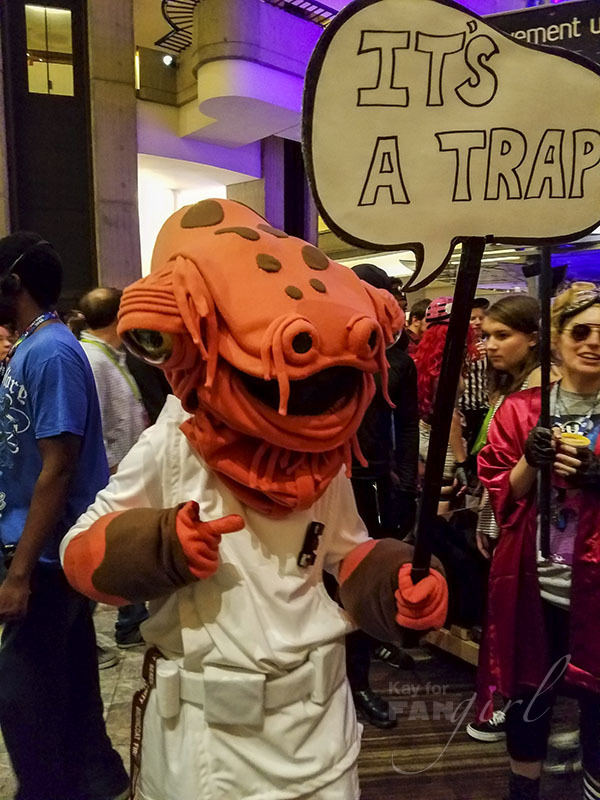 They even have a Syndrome and Henchmen! 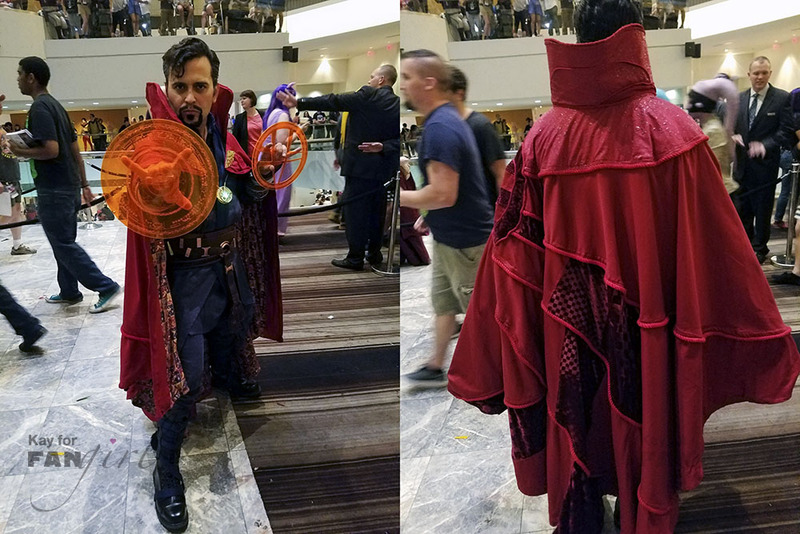 Had to take a photo from the back too because this Doctor Strange cloak has so much detail. 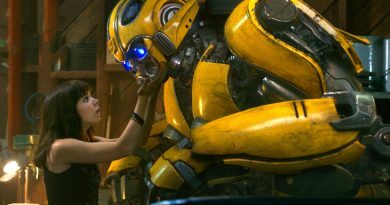 Robbie the Robot wouldn't hurt anybody. 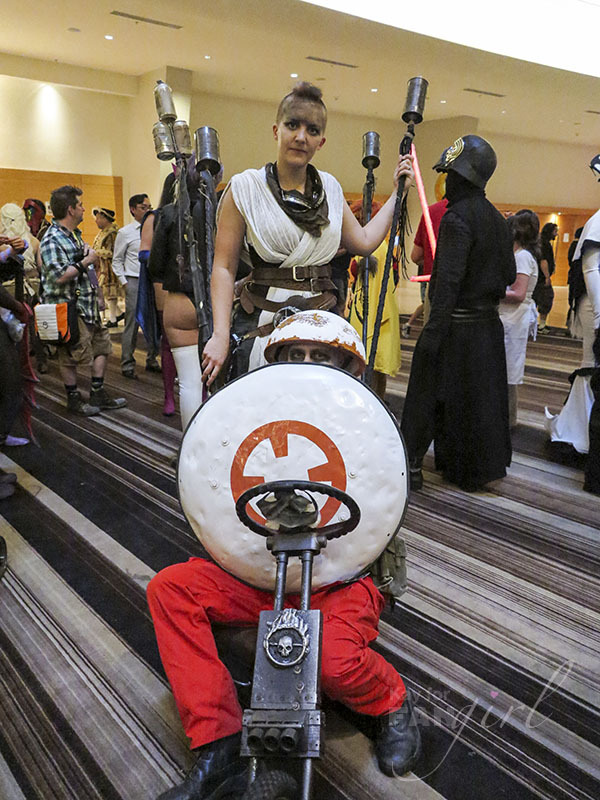 A whole group full of Star Wars-inspired geek fashion. 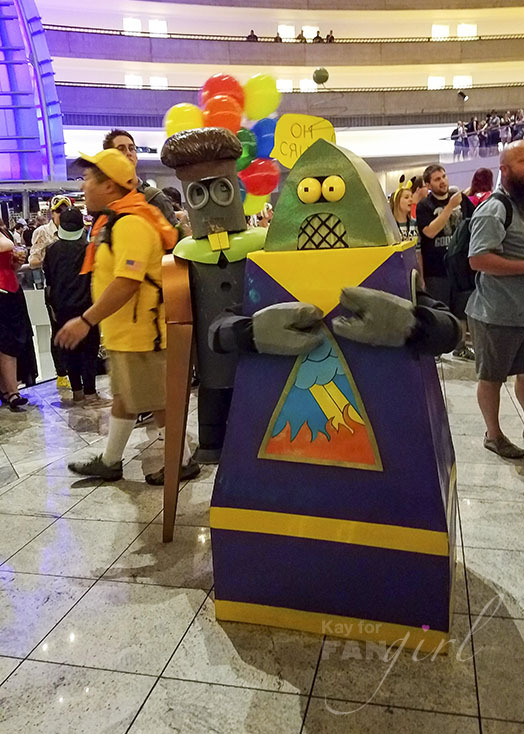 Futurama has a few robots. 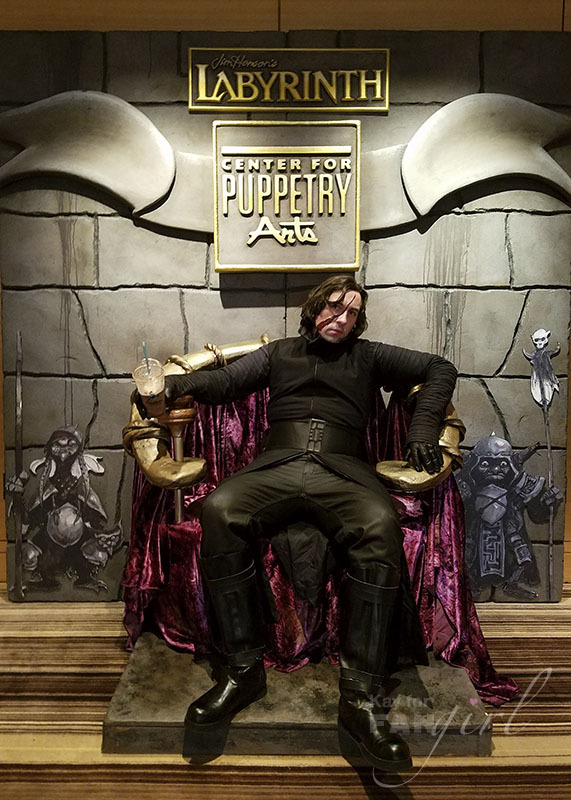 Kylo Ren is taking a post-battle break on the Puppetry Arts throne. 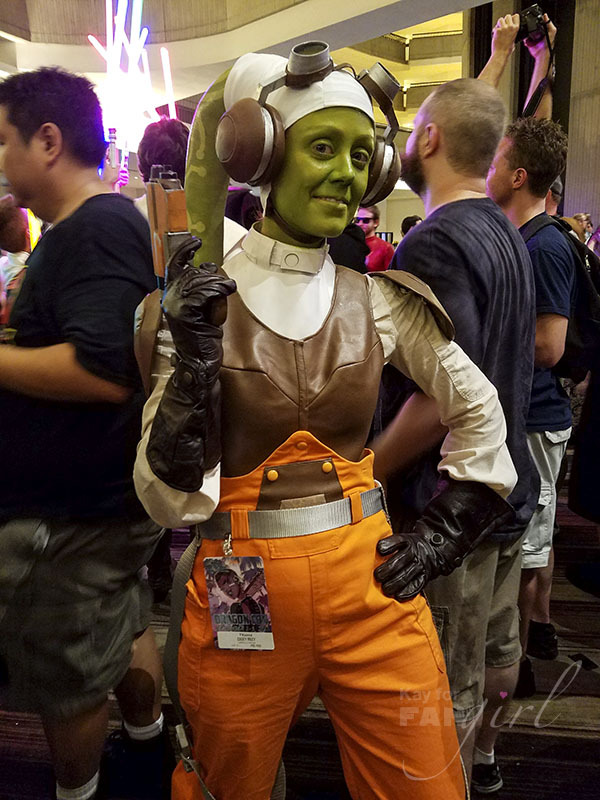 A great Hera Syndulla from Star Wars Rebels. 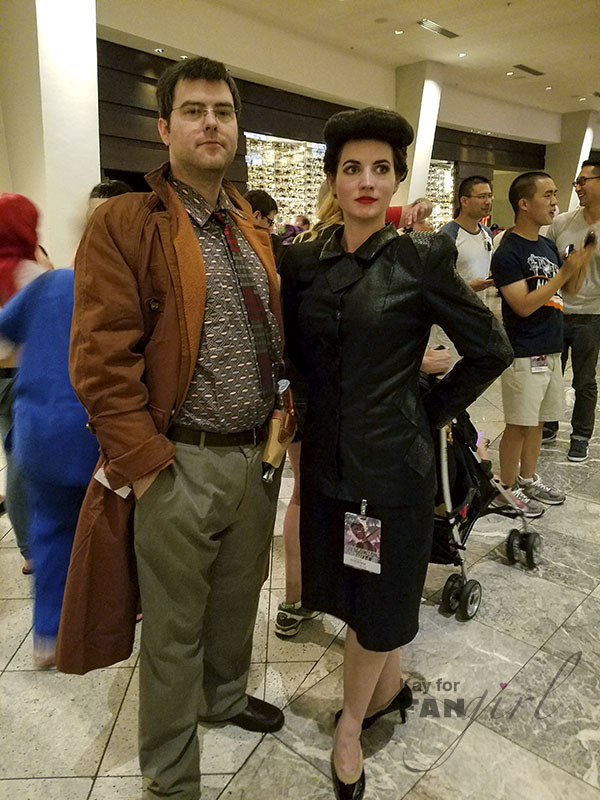 I admire a good Rachael costume. 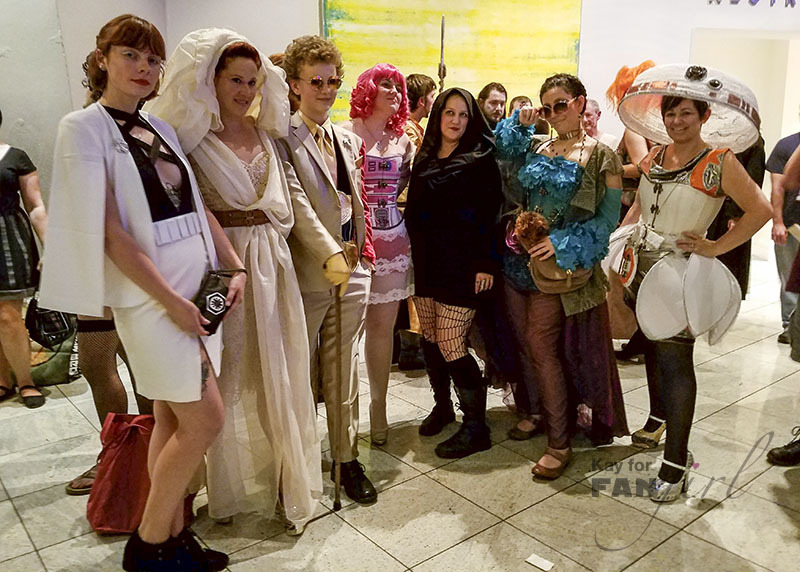 Fun fact: Blade Runner and The Force Awakens had the same costume designer. 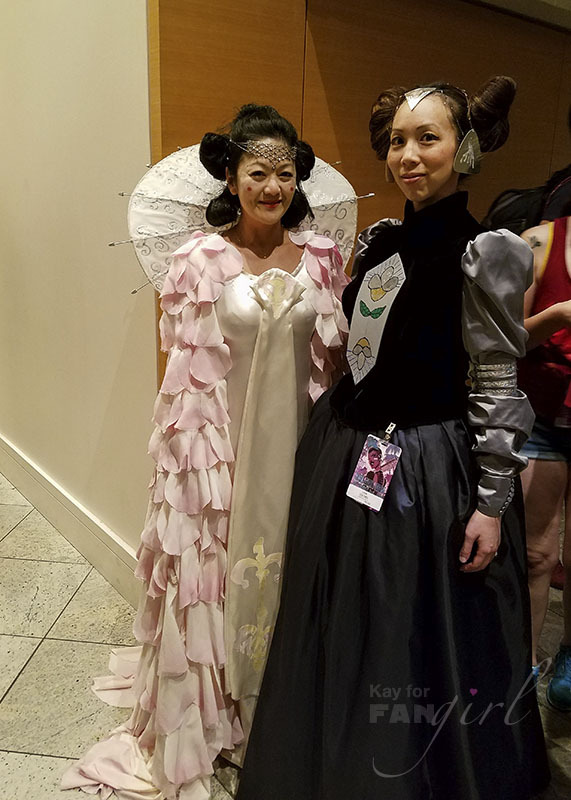 Labryrinth costumes made a few appearances. 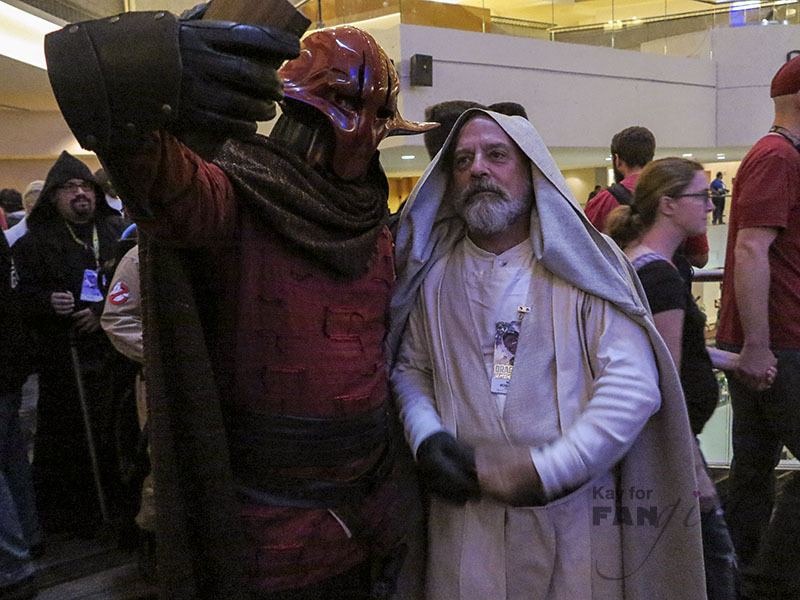 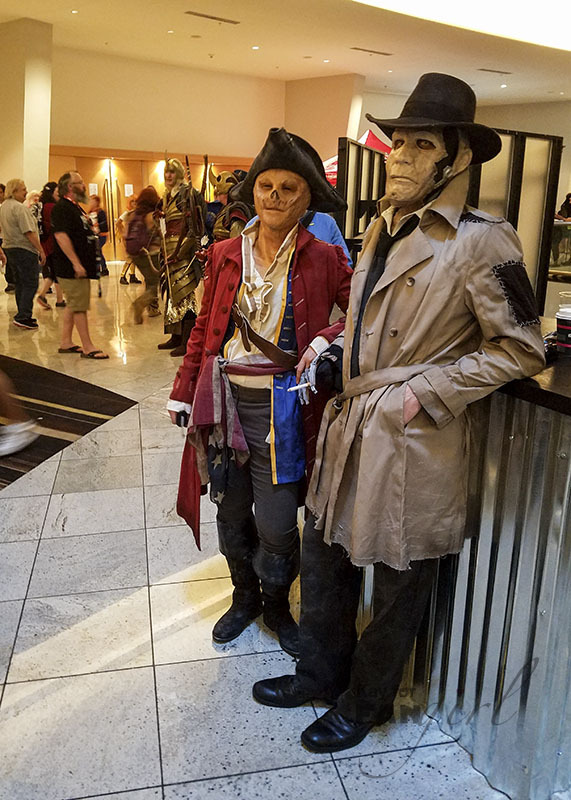 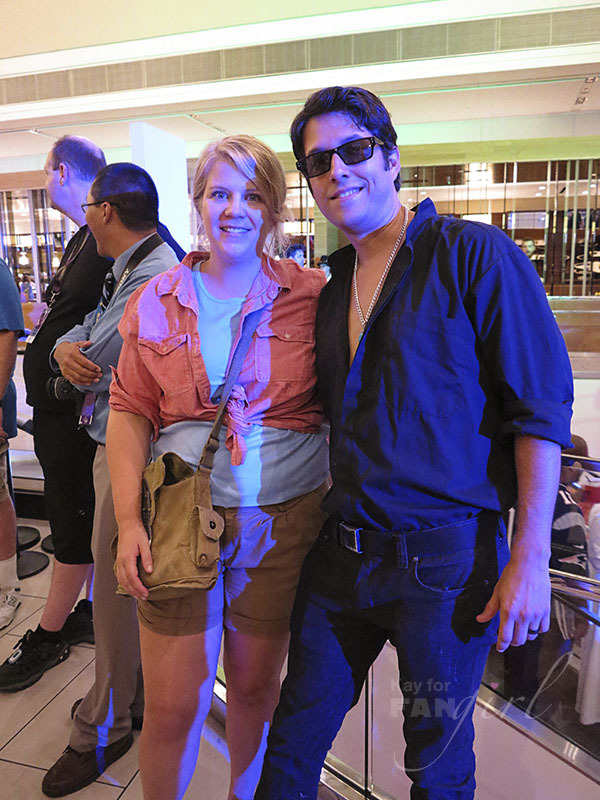 Dragon Con is a great place to find mash-up costumes. 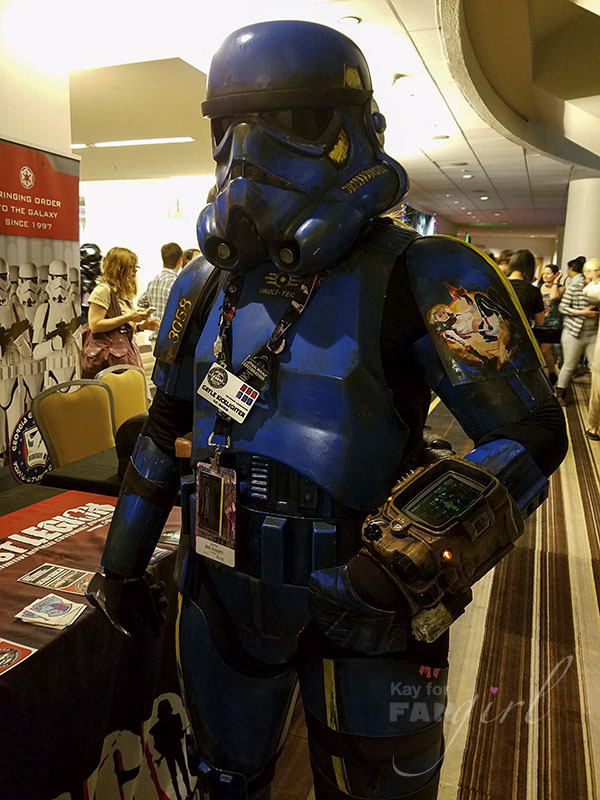 This one combines Fallout with Star Wars. 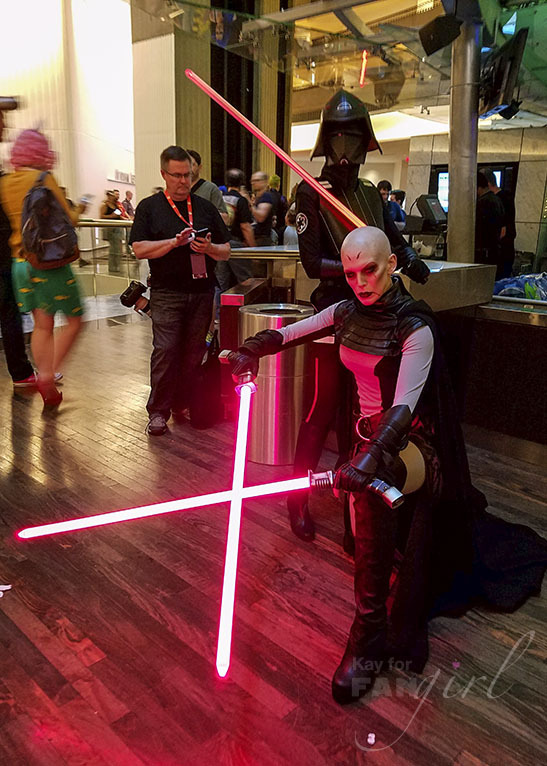 Miss Sinister makes the best Asajj Ventress. 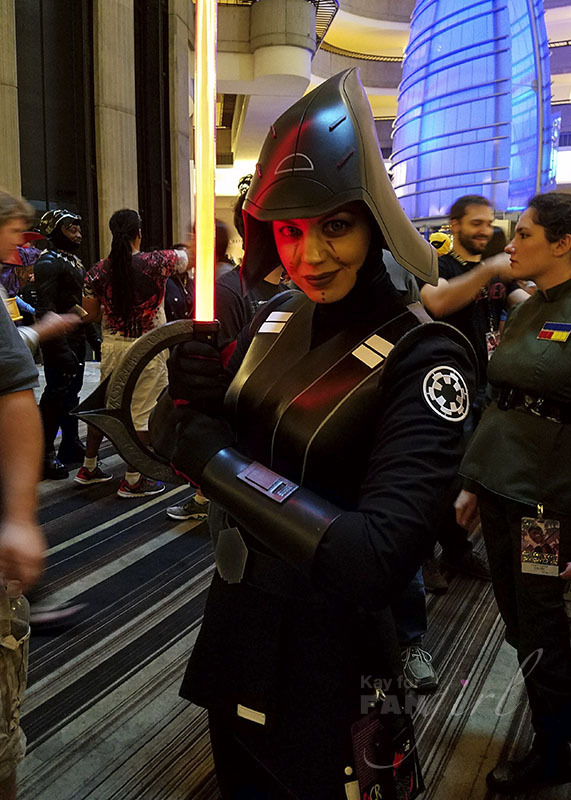 I'd been looking forward to seeing Bria's take on the Seventh Sister from Star Wars Rebels. 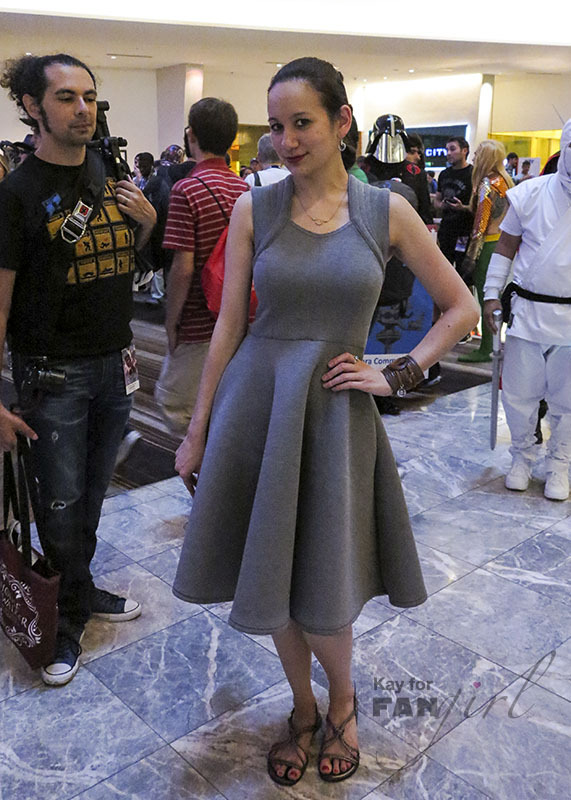 A glimpse into what it looks like from the costumer's side. 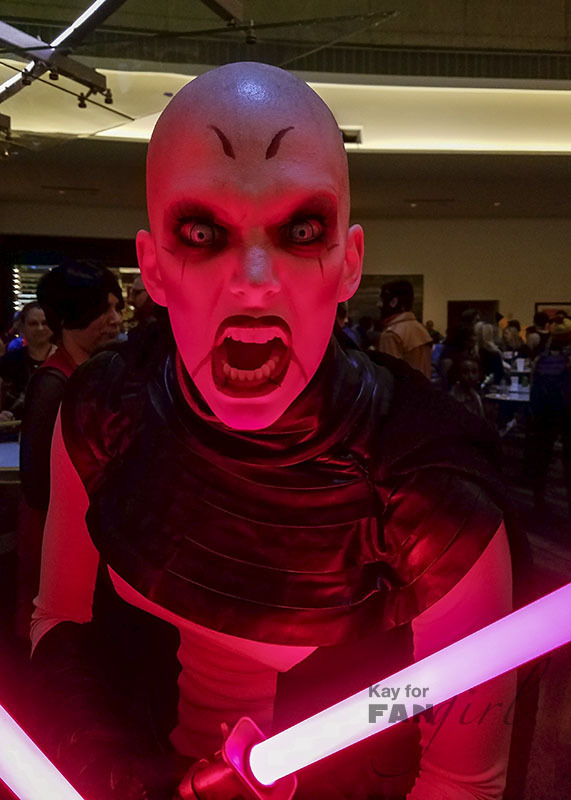 If Asajj Ventress and the Seventh Sister are blocking the bar, you might want to go to another bar. 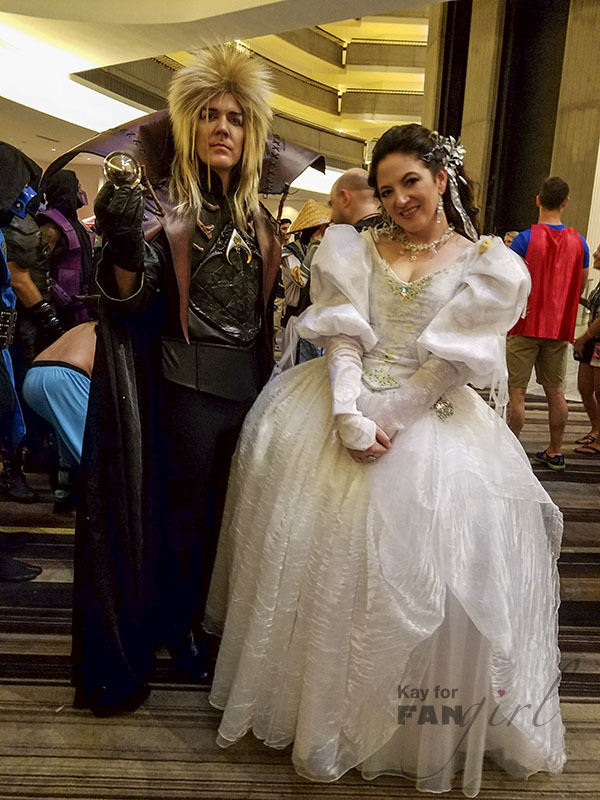 Photos by Kay. 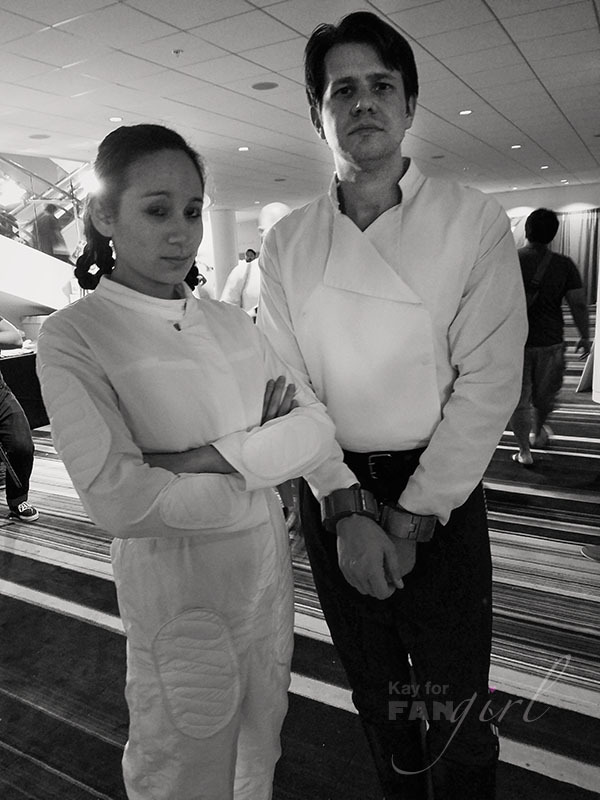 Please don’t republish this post without my permission.